I should like to give you an account of my work if I could do it justice. . . In the morning the boy gets up and makes a fire by seven o’clock when I get up and make the coffee, then I make the biscuit, then I fry the potatoes then broil three pounds of steak, and as much liver, while the woman is sweeping, and setting the table, at eight the bell rings and they are eating until nine. I do not sit until they are nearly all done. I try to keep the food warm and in shape as we put it on in small quantities. 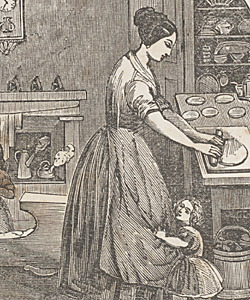 After breakfast I bake six loaves of bread (not very big) then four pies, or a pudding, then we have lamb, for which we have paid nine dollars a quarter, beef, and pork, baked, turnips, beets, potatoes, radishes, salad, and that everlasting soup, every day dine at two. For tea we have hash, cold meat, bread and butter, sauce and some kind of cake and I have cooked every mouthful that has been eaten excepting one day and a half that we were on a steamboat excursion. I make six beds every day and do the washing and ironing you must think that I am very busy and when I dance all night [she loved to go to dances] I am obliged to trot all day and if I have not the constitution of six horses I should have been dead long ago, but I am going to give up in the fall whether or no, as I am sick and tired of work. She also sewed all her own clothes, but more of that later.